Ronald W. Reagan, beloved 40th President of the United States (1981-1989), is truly an American icon. This all-American boy grew up and lived the American dream. From playing college football to sports announcer to movie star to Governor of California to the greatest dream of all as President of the United States. President Reagan loved the outdoors and relished the times he spent on his ranch near Santa Barbara. Called Rancho del Cielo (Ranch in the Sky), this retreat conveyed the true spirit of Reagan's practical, down-to-earth manner and his core principles: humility, idealism, diligence, and hard work. 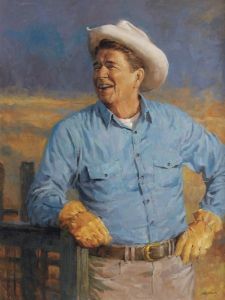 In this wonderful portrait by Andy Thomas, perhaps President Reagan had just finished one of his favorite activities at his ranch such as chopping wood or riding his horse. President Reagan genuinely loved his country and proudly told the world that he looked upon America as a great "shining city on a hill." As the commander-in-Chief of America, Reagan boldly endorsed a "peace through strength" policy that served and protected the world. Known as "the great communicator," Reagan possessed an excellent speaking ability, sense of humor, and beloved wit. Many wonderful quotes have been attributed to President Reagan; here are but a couple: "If we forget that we're one nation under god, then we will be a nation gone under."...... "Whatever else history may say about me when I'm gone, I hope it will record that I appealed to your best hopes, not your worst fears; to your confidence rather than your doubts. My dream is that you will travel the road ahead with liberty's lamp guiding you." On June 3, 2009, Mrs. Reagan helped unveil the Ronald Reagan statue in the U. S. Capitol. President Ronald W. Reagan passed away on June 5, 2004.